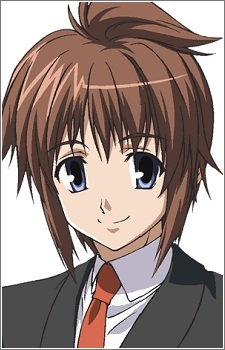 Birthday: November 1 Renji Asou who is half German, half Japanese is a protagonist of the third chapter in Ef: The Latter Tale. One day, when he goes to an abandoned train station where he often spends time, he meets a girl wearing an eye patch over her left eye and sitting alone. The girl is Chihiro Shindo, the younger twin sister of Kei Shindo. Despite both of them being mutually shy, Renji comes back to see her at the station every day after school and quickly becomes friends with her. He later learns that she has a severe case of anterograde amnesia where she cannot remember anything past thirteen hours previous, aside from the events before the accident which she can recall perfectly. Renji also finds out that her dream is to write a fantasy novel, but due to her condition Chihiro has never been able to get far. Renji loves to read novels, and after discussing it with Chihiro, he collaborates with her to see if he can finally make her dream come true. Through the process of writing the novel, the two eventually become very close and they fall in love with each other. As the story progresses and more of the novel is written, Renji soon discovers that the novel is an allegory for Chihiro's life and how she sees the world around her due to the state of her limited memory.